Premium 6FT DVI-I to RCA component cable for your monitor or projector. Connects PC/Laptop to LCD projector, HDTV, and other Y / Pr / Pb component RGB display system. Receives and transmits Component signals Y, Pr, Pb. 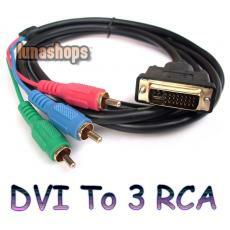 Connector Digital Visual Interface Integrated (DVI-I) male, RCA Component Y / Pr / Pb. Shields for high resolution formatting. High Quality 24K Gold Connectors. NOTE: Your display system must support component video (Y, Pr, Pb) signal output function in order for the image to display properly. Please consult with your VGA card's user manual for more information.